Operating a self-propelled forage harvester (SPFH) is a challenging task that requires an operator to multitask throughout the entire day. Filling the transport truck, coordinating machine logistics, monitoring machine performance, and maximizing throughput are all part of the job. SPFH operators benefit from Active Fill Control, which makes the process easier by reducing the amount of time the operator spends monitoring the truck filling process. Experiments using advanced eye-tracking technology were able to track where an operator’s attention was focused while operating. Operators harvesting corn without Active Fill Control spend about 32 percent of their time watching the loading process. When Active Fill Control is used the operator only spends 23 percent of time monitoring the loading process. During an 8-hour day, an operator with Active Fill Control will have an extra 40 minutes of time to focus on something else. Through a 20-day harvest season this would amount to more than five hours extra time. This time can be used to maximize throughput, coordinate a truck fleet, monitor forage quality through the HarvestLab™ sensor, or just spend time enjoying the harvest. 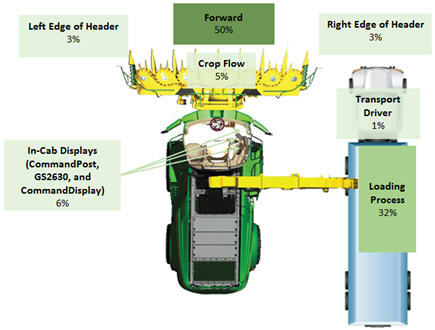 John Deere Active Fill Control improves operator comfort and reduces operator fatigue in the field. Active Fill Control automatically detects the trailer next to the forage harvester and automatically begins filling with a preselected fill strategy. The operator can focus more on machine behavior and optimization and worry less about the spout and flap steering. After headland turns, the spout will automatically return to the last filling position. The fill status of the trailer can be monitored via video overlay on a separate display, like the GreenStar™ 3 2630 or 4640 Universal Display, causing less tension on operators neck and back. 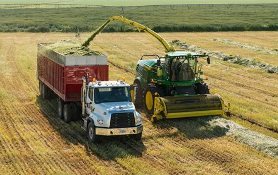 Utilizing these capabilities forage harvesting gets much more convenient, especially during long working hours and for less experienced operators. Active Fill Control also greatly reduces number of times an operator needs to adjust the spout. During typical operating conditions, an operator will adjust the spout, on average, once every 4 seconds. Throughout a normal day this could amount to more than 6000 button presses on the hydro handle. Active Fill Control can eliminate a vast majority of these presses. 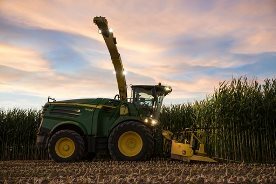 John Deere Active Fill Control is the next step for higher productivity and efficiency during forage harvest. 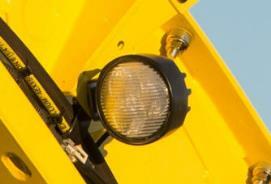 It is impossible to monitor the spout position every second while operating a self-propelled forage harvester (SPFH). Field conditions can vary including hilly terrain, wet soil and soft ground, down crop, obstacles, etc. Also, SPFH operators are challenged with a significant amount of communication and coordination. All this constantly requires the operator to multitask and react quickly to changing conditions. If the spout is improperly aimed for only a few seconds the result can be hundreds of pounds (kilograms) of lost forage. The operator can experience all the benefits of an automated filling system, including spout steering, flap automation, and fill strategy execution. 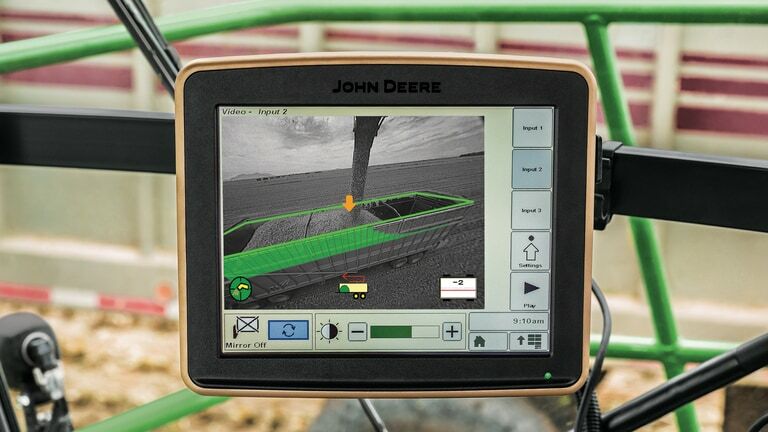 The camera automatically detects trailers and the current fill level once alongside the forage harvester, ensuring consistent filling of trailers and allowing the operator to fully focus on machine behavior and optimization in order to maintain peak performance at all times. Working days during harvest are long and often go through the night. Active Fill Control includes an additional light-emitting diode (LED) spout light package that ensures a steady fill, even in darkness. The design has also been optimized to ensure functionality under varying light, dust, shading, or rain conditions. 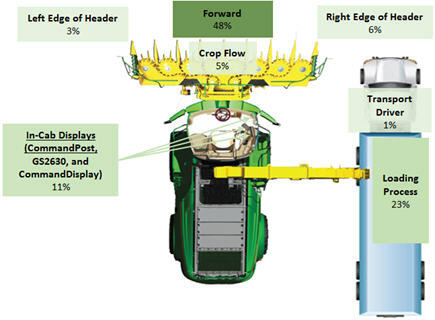 Step 1: Set up desired fill level and fill strategy in the self-propelled forage harvester (SPFH) CommandCenter™ display. As soon as Active Fill Control is engaged by the operator, the system will continuously look for a trailer in the camera field of view and fill it automatically, once detected. Never has forage harvesting been easier. 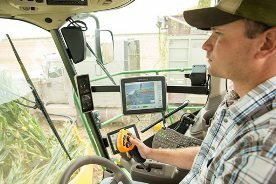 The forage harvester operator has the option to simultaneously monitor the filling progress on any video screen mounted in the cab. No need to turn the head anymore and lose view of the crop flow.